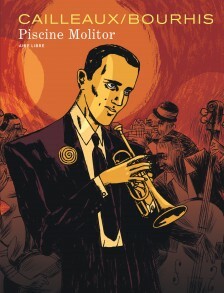 The first biography of Boris Vian in comic strip! A brilliant dilettante, Boris Vian left his indelible mark on the 1950s: a novelist who was sensitive (‘L’écume des jours’ [The dregs of the days], ‘l’Automne à Pékin’ [Autumn in Peking]) or scandalous (‘J’irai cracher sur vos tombes’ [I’d spit on your graves]), a satirist (‘Je suis snob’ [I’m a snob]), jazz fan (journalist and artistic director of a record company, he was a friend of Miles Davis), musician (at the Tabou, where he played the ‘trompinette’), Germanopratin pataphysician (with Jean-Paul Sartre and Raymond Queneau, he embodied the legend of post-war Saint-Germain-des-Prés). Exactly 50 years after his death, Aire Libre pays tribute to a legend of literature.